The Itty Bitty Kitty Committee: A Special Day, Indeed! Today is one of my favorite days of the FUNdraiser - it's Special Needs day. I think it might be one of your favorite days too because, in the past, we've always raised a ton for the fund on this day. Thousands of cats pass through our shelter each year. 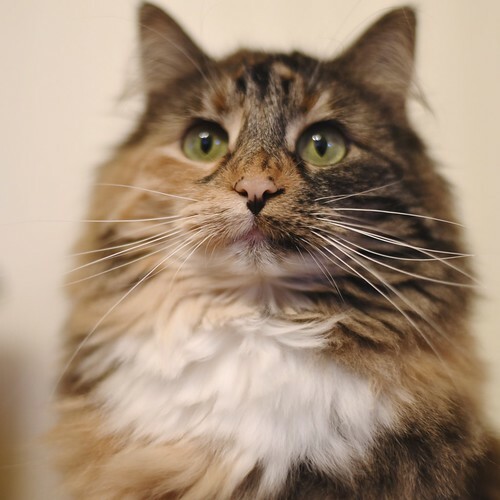 Most don't require much more than vaccines and basic medical care before they're ready to hit the adoption floor, but some cats need more. These are our Special Needs cats and kittens. A Special Needs kitty may need surgery, a special diagnostic procedure, medication, special foods, or a visit (or visits) with a specialist. Our donations today will all be contributed to the Special Needs Fund. With this fund, the vet staff can take those extra steps to get these special cats healthy and adoptable faster, which means less time in the shelter and less stress on the cat. And any steps the shelter can take to make a cat healthier lowers the likelihood of a future financial burden or worries for the adopter. Our dear Wylla fell into the Special Needs category. When she was still our foster kitten because these funds were available, they were able to diagnose her Mega Esophagus, a very rare condition for a cat, and it allowed us to take her to a specialist and get the extra care, medicines, and additional testing she needed. 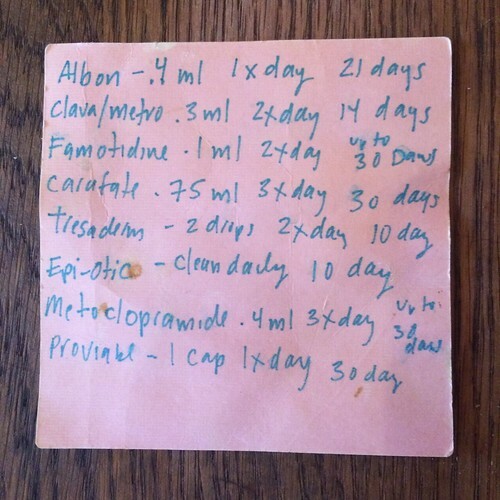 This is the lengthy list of medications Wylla took while she was under the care of our shelter vet and specialist, too. Thank goodness these funds were available to cover all of this. 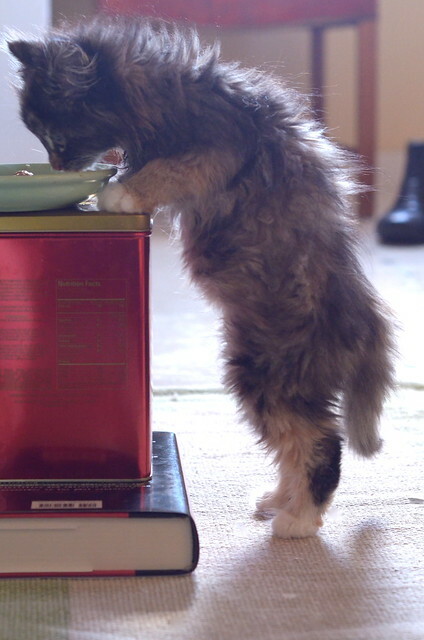 Here is wee Wylla, shortly after she was first diagnosed with Mega-E.
Because the muscles of her esophagus weren't doing their job, she learned to eat vertically so gravity could help get food into her stomach. Her vet suggested we give this eating technique a try, and once we did, things started really turning around for her. And once she got a little better, a little bigger and became "adoptable," well, you all know what happened next. The Special Needs Fund helped us get her condition to a manageable point, then on the road to good health. I'm so grateful this fund exists. Without it, we wouldn't have our healthy girl today. Because our Awesome Anonymous Donor has a soft spot for these Special Needs cats, she's offering up a very generous $5000 matching donation challenge today to help grow this fund up. For every dollar we donate today, she'll be doubling it until we hit the $5000 cap. This matching donation challenge will run until 7:00 PM Pacific Time, but all that we contribute until 8:00 AM tomorrow will go towards the Special Needs Fund. Today is a very good day to donate. Not only because of this generous match but because this fund does so many wonderful things. It gives our shelter the resources to go above and beyond. It makes these special cats THRIVE, and it gives them a very bright future. To make a tax-deductible donation and contribute to the Special Needs Fund, please visit our fundraising page. I've got some stories of some of the Special kitties who have benefited from this fund that I'll be sharing later this morning. It's always nice to see who you're helping, so I'm quite excited to share these with you! ALSO, we've got auctions starting today! We'll kick off the surname auction for our new litter, and we've got some art to start as well. We said our goodbyes to the remaining Fellows on Friday, and I've got their adoption tales to tell. I'll post one today for sure, and a second if time allows. Today is going to be full!! This whole week is -- so stay close, please! Thank you for all of the love and support you show us each day. You're giving spirit and kindess are so inspiring. Gosh, I love this community of ours. xoxo! That photo of Wee Wylla gets me every time I see it! She has been a fabulous assistant to Charlene, loving on and playing with kittens. I love that cute fluffy tummy and wild hair, she is and was so cute !!! Just made a donation. So glad I didn't miss the "Special Needs" day!